A non-digestible gel with electrolytes for the treatment and prevention of calf diarrhoea. When should Rudduck Mega-Lyte Plus be administered? 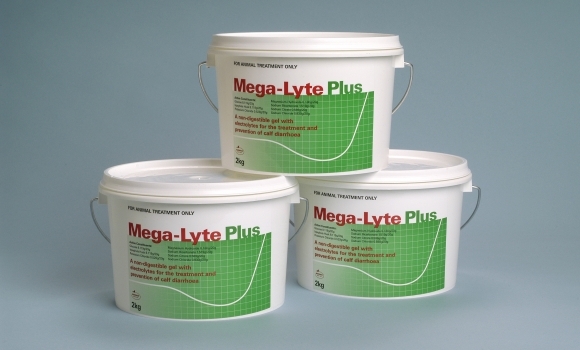 AS A TREATMENT Mega-lyte Plus should be given as soon as any signs of calf scouring are apparent. AS A PREVENTATIVE Mega-Lyte Plus should be given upon entry to the calf rearing unit (property where the calves will be reared). It may also benefit stressed calves. If marked clinical improvement is evident following the second treatment, the third treatment may be the reduced final treatment at 24 hours (the fourth treatment not being necessary). Reduced treatments should be administered every 8 hours after the sixth treatment(2 scoops in 750mL water plus 750mL warm milk), and such cases should be closely monitored. Following the final Mega-Lyte Plus treatment, normal feeding should gradually be resumed, and when some clinical signs of diarrhea persist, a half scoop (10g) of Mega-Lyte Plus may be added to milk at each feed until recovery is complete. How should Mega-Lyte Plus be administered to PREVENT calves scouring? One standard treatment (3 level 20 g scoops of Mega-Lyte Plus diluted in 1.5 litres of warm water) should be administered on entry to the calf rearing unit.